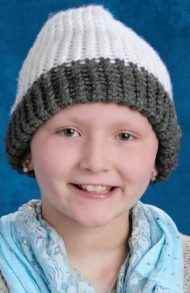 Megan L. Martin, 11, of Millersville, PA, passed away from a courageous battle with Leukemia on January 22, 2019 at her home surrounded by her family. Born in Lancaster, she was the loving daughter of Clinton and Jessica (Hess) Martin. Megan was a student of Penn Manor School District where she enjoyed playing basketball and the flute. She loved music, especially Taylor Swift. Megan was a Girl Scout. Surviving are her parents, Jessica and Clinton; and siblings, Audrey and Joel. A viewing will take place from 6-8 PM on Friday, January 25, 2019 at Central Manor Church of God, 387 Penn St, Washington Boro, PA 17582. Viewing will continue on Saturday, January 26, 2019 from 10-11 AM at the church with a Celebration of Megan’s Life to begin at 11 AM officiated by Rev. Scott Davis. Megan will be laid to rest at Millersville Mennonite Cemetery. In lieu of flowers, contributions in Megan’s memory may be made to St. Jude Children’s Hospital, 501 St Jude Place, Memphis, TN 38105 or to Four Diamonds, Penn State Children’s Hospital, https://fourdiamonds.donordrive.com/. I came across Megan’s Obit while searching for someone else’s. I have to say it stopped me in my tracks. I watched her tribute video and was moved to tears I don’t think there’s a picture with her where she’s not smiling. I don’t know you or your baby girl but i am a mother of 4 and from one mom to another please know I am sending you all the strength I have to help you during this difficult time. Your family will be in my thoughts and prayers. Heaven has gained an angel. May she forever Rest In Peace and paradise. I am so, so sorry for the loss of your Megan, who is in God’s precious hands. What a special young lady. It’s OK To Be in This Much Pain. Please rest and take time to heal both physically and emotionally. Lots of hugs and handholding. I care and am thinking of you. I prayed for Megan and your family throughout your journey. Your faith and Megan’s is an inspiration. Jessica, Our deepest sympathy to you and your family in your time of loss. Praying for peace, comfort, and continued strength for all of Megan’s loved ones. Bobbie Jean and Tim, I was so sorry to hear of your loss. Deidre and I extend our deepest sympathies to you, to Clint and Jessica. Your tremendous faith in God will hold you up. My prayers go out to your family. I have never seen you without a smile. You are the strongest girl I have ever met. You are such an inspiration and I will do my best to honor you. You will live forever in my heart! I imagine there is no pain more far-reaching and deeper than losing a child. My heart and prayers go out to you at this most difficult time as your feeling of loss is deep. May the promises of Jehovah God and Our Lord’s Christ Jesus, of a resurrection, strengthen your hearts until the day when death is no more, and honest-hearted ones will see lost loved ones once again, including Meagan (Revelation 21:4,5; John 5:28). In the meantime, may the love and support of dear family and friends comfort you. “There are some who bring a light so great to the world that even after they have gone the light remains.” This was, and still is, Megan. May your family find the strength to carry on. From my family to yours, we send heartfelt thoughts for peace and comfort. Our precious granddaughter, you will always be in our hearts. We love you so very much. We are next door neighbors to Fred and Carolyn Mackey and have been praying for Megan and your family all through this difficult journey. We will be praying for you as you adjust to her passing. God will meet your every need. We so are sorry for your loss. Our hearts grieve with you for this tremendous loss and for the having to “say goodbye” to Megan so soon. Our hearts celebrate your amazing LOVE and STRENGTH as a family and how you’ve been carried by God’s love and how you’ve honored God through this very arduous journey. We celebrate also that Megan is seated in heavenly places right now–what she must be seeing and experiencing! We are praying for you and and will continue to lift you up on this road of suffering. Love and peace always from our hearts to yours. Megan was so sweet and fun!! Scott and I loved when she played her ukulele for us and sang!! She loved art and music and jewelry and makeup and her family and friends!! She knew God and trusted Him. She was so brave and courageous!! Amazing strength! She passed from life to LIFE!! Praying for your peace and comfort as she will be dearly dearly missed. Love you guys! My condolences to your family.You had such a beautiful smile.May you rest in God’s arms.My prayers are with you.